Allergen Statements / Claims Natural Cherry & Orange Flavors • No High Fructose Corn Syrup • No synthetic (FD&C) Dyes • No Gluten. 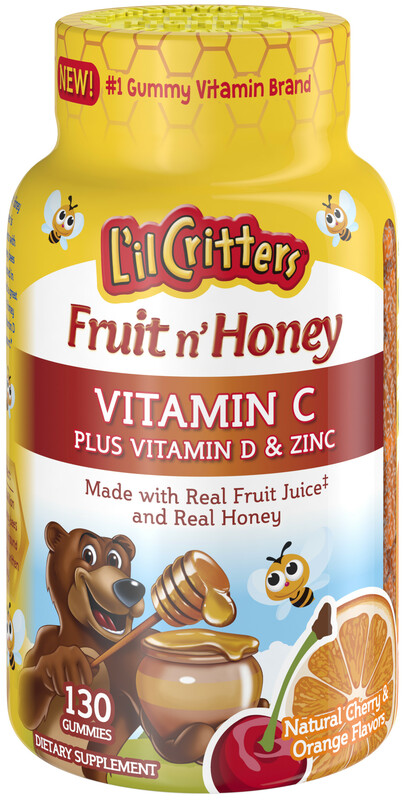 Other Ingredients Honey, sugar, pear juice concentrate, gelatin, water; less than 2% of: citric acid, colors (annatto extract, purple carrot juice concentrate), fumaric acid, Inositol, lactic acid, natural flavor, pectin, and sodium citrate. Serving Directions As dietary supplement, parents may give each child two (2) gummy bears per day. Instruct child to chew each gummy thoroughly. Precautions Take only as directed. Do not exceed suggested dosage. If your child has a medical condition or is on medication, please consult a physician before using this product. Not recommended for children under two years of age due to choking. Do not use if inner seal is broken or missing. This product may settle during shipping. Do not expose to excessive heat or moisture. Colors will darken over time. This does not alter the potency of the product.